Emoji characters are a great way to have more expressive conversations and bring some fun into messaging, but tapping the globe icon on the iOS virtual keyboard to select a character isn’t exactly fast. Accessing the Emoji icons is even harder if you’re using an external keyboard with an iPad or iPhone since your fingers have to leave the keys to tap the screen, but it doesn’t have to be this way. Instead, you can type out Emoji incredibly fast by using text substitution shortcuts, which basically convert one regular keyboard sequence into another character. With support for Emoji keyboard now on, Emoji characters are accessible through the little Globe icon that sits at the bottom of the virtual keyboard, and you can proceed to create the substitutions. 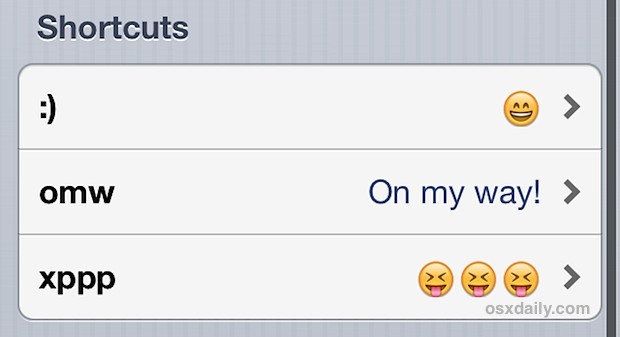 You can add as many Emoji substitution shortcuts as you want. Once you are satisified you can try them out by entering into any iOS app that allows for text entry (Notes, Mail, Messages, etc) and then just enter a defined shortcut, which should then instantly convert to the appropriately defined Emoji icon. 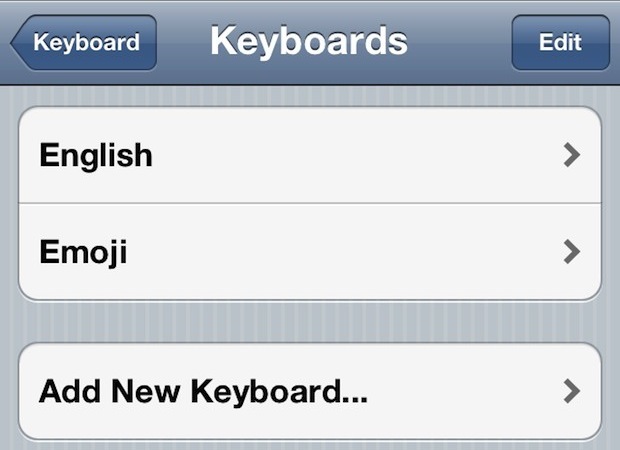 For example, the common emoticon “:]” will automatically convert to  and so on. 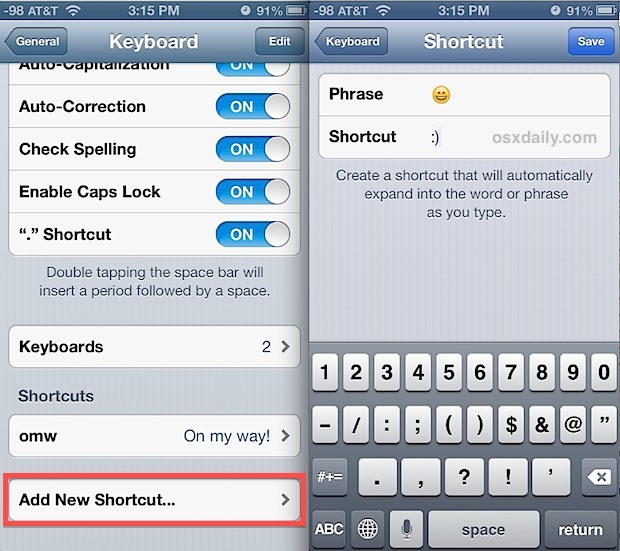 To make typing Emoji even faster, skip the secondary special character keyboard screens and set the shortcuts to only come from the primary QWERTY keyboard. For example, setting xppp to turn into , this is faster since you don’t have to switch keyboards to type the semicolons, brackets, and other common emoticon elements. 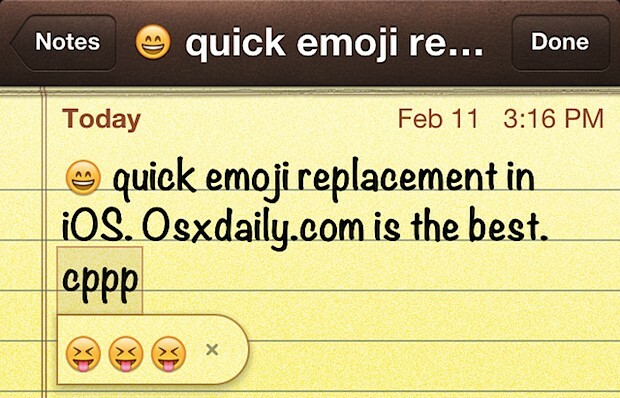 Another nice advantage to this approach, is that the Emoji replacements become autocorrect suggestions immediately, so in the latter example of ‘xppp’ you can mistype it as ‘cppp’ or something similar, and it will still recognize the replacement intention and suggest that, letting you just tap the spacebar to autocorrect to your Emoji. A very similiar trick can be done in on the Mac side of things by using OS X text substitution to automatically convert text characters into Emoji icons. Could we please get some useful and/or interesting articles? There is no reason there should be this much time and effort dedicated to stupid smiley faces. I found this useful. Now what?